Breakfast served via open buffet in Madinah and Makkah accommodations. Three Weeks Package: Departure date is July 28th from Toronto to Madinah with return date of August 20th from Madinah to Toronto. Express Hajj Package: Departure date is August 3th from Toronto Jeddah with return date of August 17th from Jeddah to Toronto. Departure from other cities can be provided as a separate ticket. Milli Gorus accommodation from arrival to Madinah until departure to Makkah. 24 hours Shuttle buses from lodging to the Haram will be provided until 5th of Dhu’l-Hijjah. Rooms in Shishah building will be accessible during the days of Hajj. Milli Gorus Hotel Makkah – in the last days prior to departure back to Canada. Milli Gorus air conditioned tents – meals & beverages included. Coach buses from Makkah to Madinah. Guided tours to historical locations in Makkah & Madinah. Room in Makkah and Madinah are based on 5 in a room. Quadruple, triple & double occupancies are available for an additional cost. Package price includes Saudi VAT & Municipality tax. Package price includes: Hajj Tawafah Fees. Package price includes: Safety Box Services, Materials to be used in Hajj, Pilgrimage Guide and Pilgrimage Book, 10 liters of Zamzam Water, Ihram and Men’s Belts. If you have any questions, please feel free to contact Ahmet Erdogan for English Inquiries at 416 476 9835 or Bilal Gulmez for Turkish Inquiries at 647 309 2877. 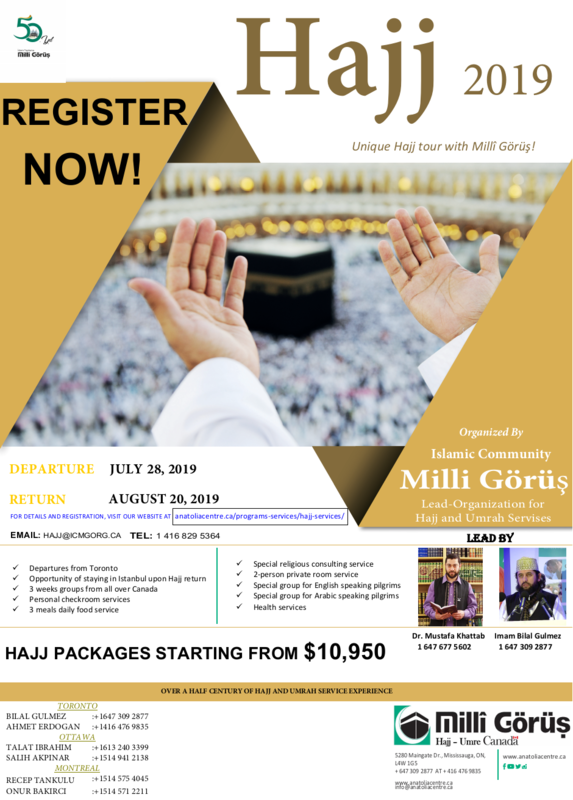 Click HERE to REGISTER for HAJJ ONLINE! Use the online registration link to quickly reserve, book and make deposit payment for your Hajj package. Please make sure that you fill all fields, after filling the application you will need to click Next to submit your application and get the link for Deposit payment.